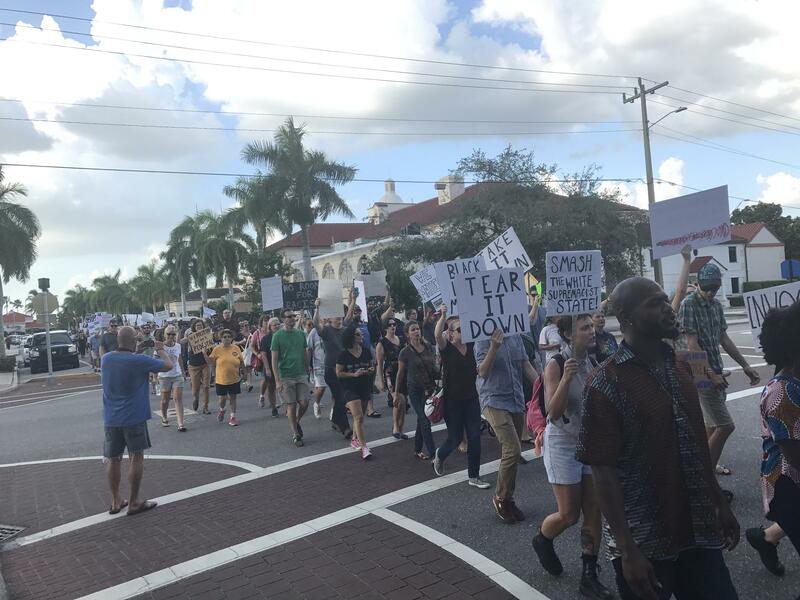 A few hundred people marched from Twin Dolphin Marina to the Manatee County Courthouse to protest the Confederate statue there. Manatee County Commissioner Charles Smith (right) of District 2 at the frontlines of the protest march. 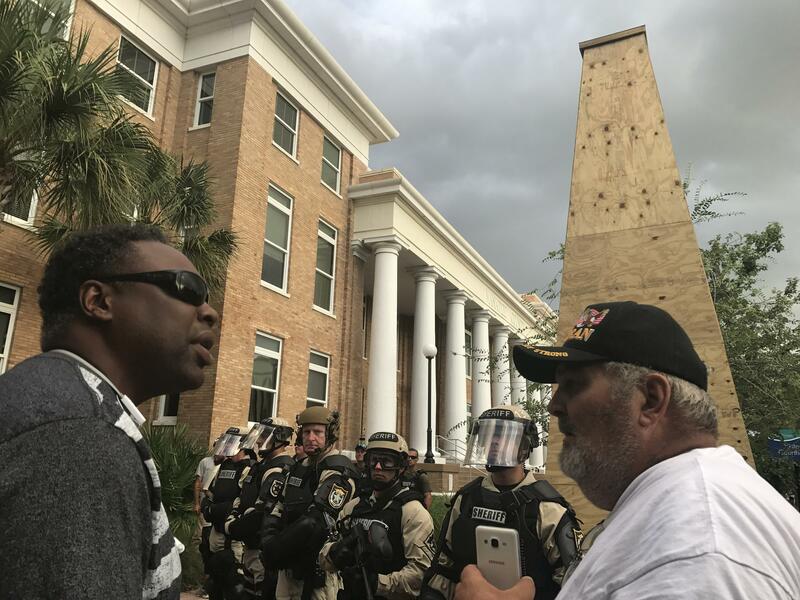 Manatee Sheriff's Office deputies surrounding the Confederate monument, which was boarded up by the county ahead of the protest. A few dozen counter protesters, who wants the Confederate statue to stay, were at the courthouse awaiting protesters who want the monument moved from the public space. Two disabled veterans discussing what should be done with the statue. After the official protesters marched away back to Twin Dolphin Marina, others stayed in a stand-off with counter protesters. Law enforcement horses eventually broke up the stand-off. Across the street from Twin Dolphin Marina, Black Lives Matter Manasota leader Shakira Refos prepares the protesters for what they’re marching into. She uses her megaphone to tell them there are people with differing opinions at their destination: the Manatee County Courthouse. 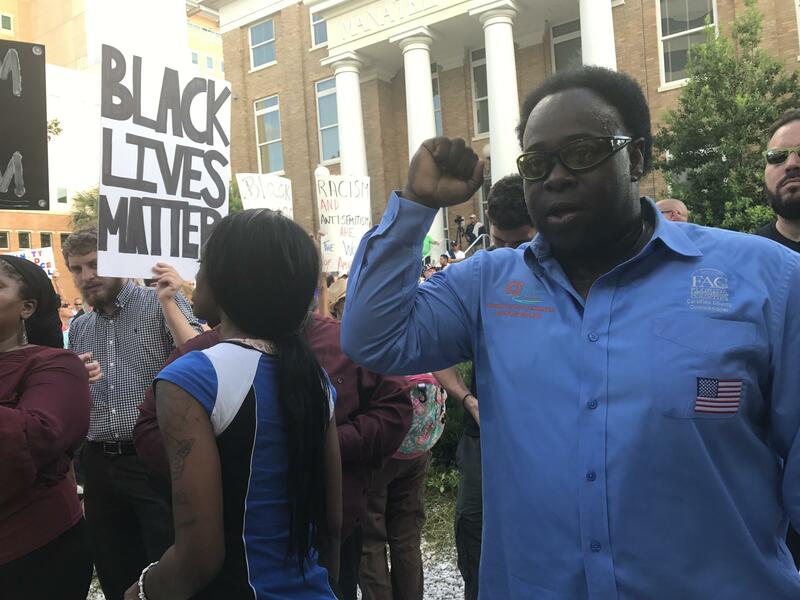 Black Lives Matter Manasota leader Shakira Refos telling protesters, who want the Confederate statue removed, not to interact with the counter protesters, who want the Confederate statue to stay, waiting for them at the Manatee County courthouse. "When you get there, people are going to try to antagonize you. They’re gonna try to ask you questions. They’re gonna try to call you names. They’re gonna try to do a lot of things that takes you off of your focus," says Refos. "And it's very important that we just pretend that they are literally not there... they're not there." The protesters start their half-mile march, carrying signs saying things like, “All unite to end racism,” and “No KKK, No fascist USA.” They want a confederate statue that stands tall in front of the county courthouse removed from the public space, and put somewhere like a museum. One of the people leading the march is Manatee County Commissioner Charles Smith of District 2. He says the monument represents treason, slavery and the overall suppression of black people in America. 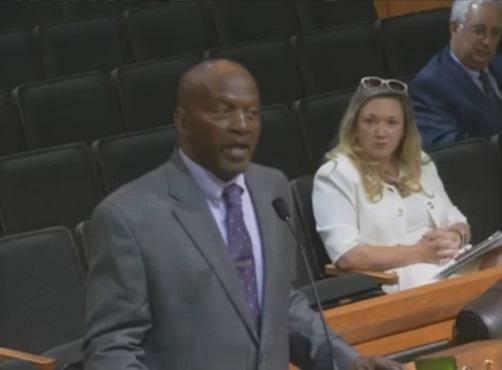 Manatee County Commissioner Charles Smith, representing District 2, protesting the Confederate monument. "The monument is detrimental to our community because of the fact that we gotta tell the whole history, not part of it," said Smith. "We don’t need to teach our children hatred. The white supremacist groups, KKK, neo-Nazis have hi-jacked the monument all across America have turned it into a symbol of racism and they want us to teach our children that but we must be better than that we must understand that we all was created equal. That courthouse is supposed to be for equal justice. It's not for white justice. It's not for black justice. We are all one people." The marchers arrive at the courthouse gazebo, just a few feet away from the statue, which the county has hidden with boards of plywood to protect it. Manatee County Sheriff deputies surround the area wearing riot gear, standing motionless, while keeping a watchful eye. Behind the gazebo, a few dozen counter protesters have their own megaphones and signs… and also a large confederate flag waving in the air. Both groups eventually interact. 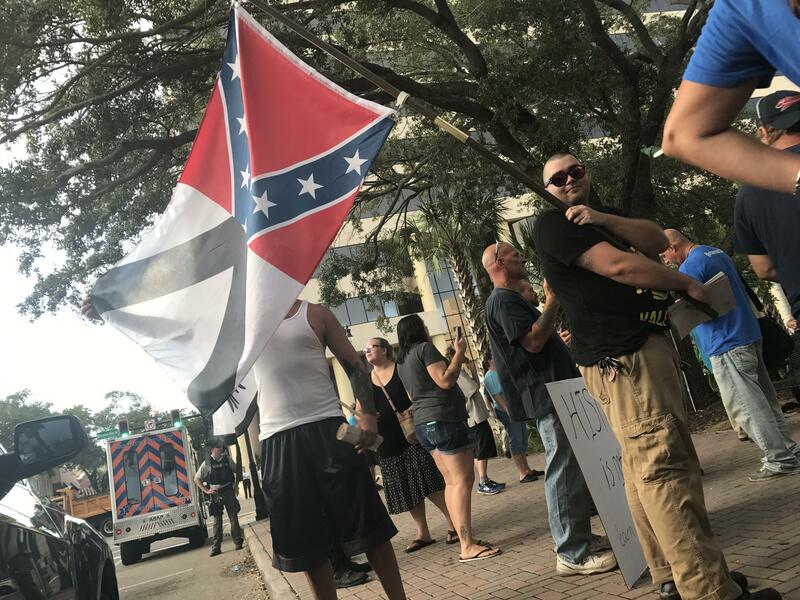 Counter protester waving a Confederate flag during the protest of a Confederate statue on public grounds. Counter protester Bob Bolus, who wants the Confederate statue to stay, shouts to protesters within the gazebo: "You don’t like America? Go back to Africa!" he says as he points both middle fingers to them. A protester who wants the statue removed shouts back: "Why'd you bring us here? Why did you bring us here on the ship?" Then Shakira Refos, the Black Lives Matter leader, puts a stop to it. "Stop! What are you doing? Turn around!" she yells. "Do not engage!" The protesters turn their backs to Bolus, who says the monument is part of American history. Bob Bolus pointing at people who want to take down the Confederate monument in front of the Manatee County courthouse. He wants the statue to stay because he says it's a part of history. "I’m not a racist anywhere. I have black people work for me in my companies," he said. "What I was telling them: respect is earned not demanded... They’re here being radical terrorists. Everything they’re doing is radical. They’re tearing down American history. They don’t have that right. They don’t have any more right with Black Lives Matter crap than anybody else does." Despite other scattered verbal arguments, the event ends with people protesting the confederate statue holding hands and singing: " They tried to bury us. They didn't know that we were seeds." Queen Meccasia Zabriskie is a leader of Black Lives Matter Manasota. Shakira Refos and other protest leaders gather at a restaurant just after the march. "It was really powerful," she says. "It was awesome to see these people from all different walks of life just come together. We marched, and then we stood, and we applauded, and we listened to one another. We resisted antagonization, we turned our backs to it and turned it with love. There was so much love there that's the best part." 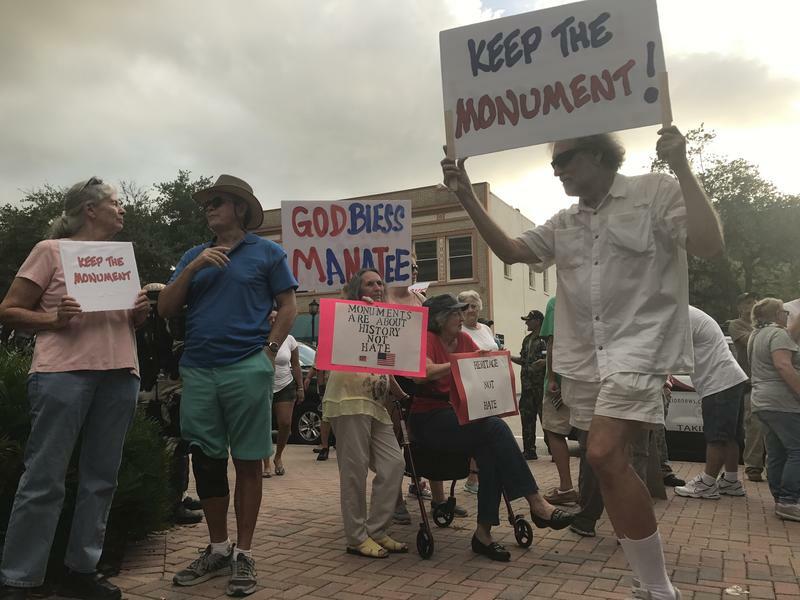 During a heated, hours-long meeting Tuesday Manatee County commissioners voted 4-3 to move the statue from the courthouse grounds to an “equally, prominent, respectful location” due to safety concerns. Potential sites include the Veteran’s memorial park and Gamble mansion. 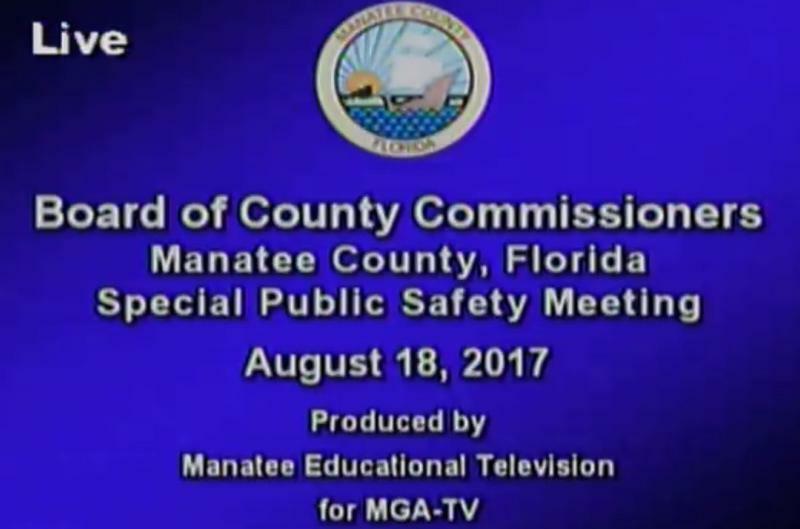 A future meeting with public comment will be held to choose the location. Several hundred people held an anti-racism vigil Monday night at the Unitarian Universalist Church of Greater Naples. 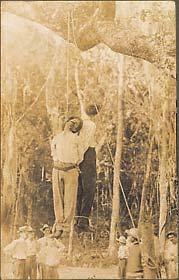 May 25 and 26 will mark the 90th anniversary of the lynching of two black youth in Fort Myers. We’ll take a step back into our region’s history for a closer examination of what’s known about the lynching and its impacts along with a broader look at the phenomenon of lynching in the history of the American South. We’ll also hear from a self-described ‘picker’ who’s collected more than 100 photographs and postcards documenting lynchings throughout the U.S. carried out between the late 1800s up through the 1950s. The disturbing photos are collected in the book “Without Sanctuary.” Some descriptions in this conversation may be upsetting or disturbing to some listeners.